(03-04-2015, 05:40 PM)brucedilis Wrote: Fairly new to maketrade. Still learning but so far my comments are. 1) They don't have a six pack like COL or BPI - they call it depth matrix and I can only view up to 4 stocks. 2) Can't find a way to save my settings, I need to setup the screens everytime I login. 3) No way to view who's buying and selling positions. Medyo limited but charting appears to be good.. BPI i think is still the worst in terms of outages and service uptime. Add ko lang ito. 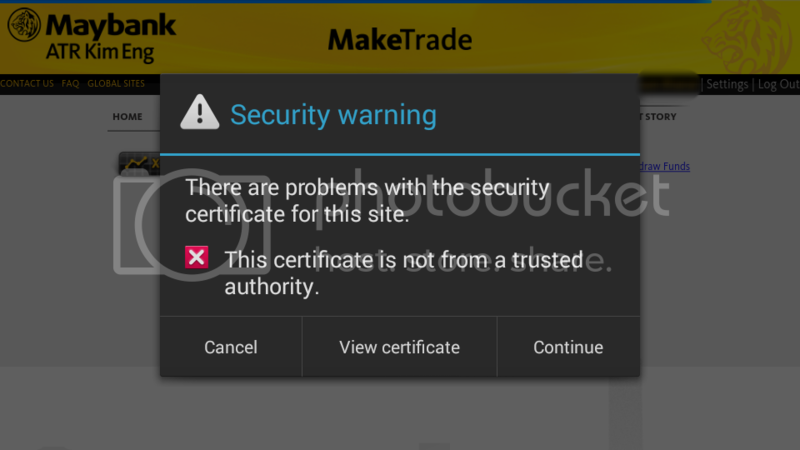 Usually when you make a trade (either buy or sell), maketrade will send you a trading confirmation. If you click on the equities tab and select any of your stocks then click detail, you will notice that the fees and computations written on the trading confirmation does not match the ones on the details. I think this is a disadvantage to the user especially if you're going to trade in large quantities. Kumusta naman ito kung sa phone or tab i-open ang interface? May dependency ba ito sa java? Di ba chartnexus ang charting nito? 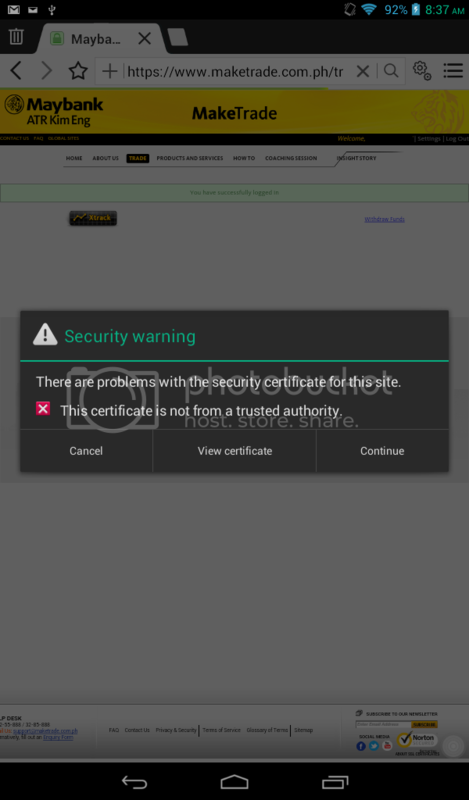 (04-21-2015, 01:31 PM)ippfx Wrote: Kumusta naman ito kung sa phone or tab i-open ang interface? May dependency ba ito sa java? Di ba chartnexus ang charting nito? Sa tablet ko na dual core (1.2 Ghz) na may 1 Gig na ram, ok naman. 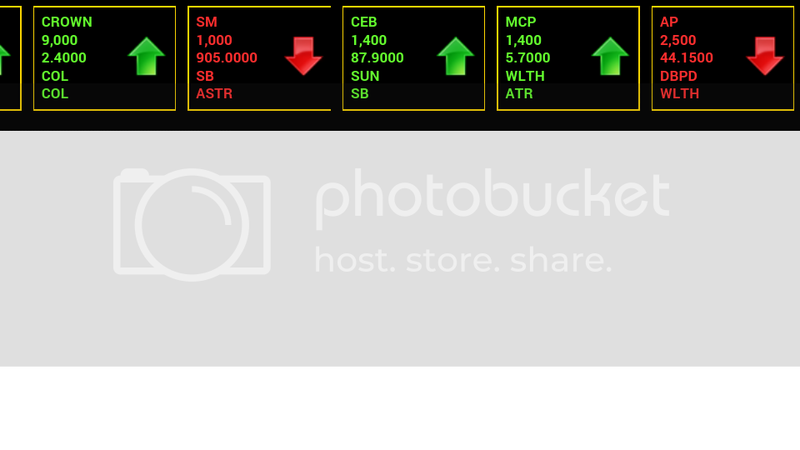 Nagbubukas naman yung interface ng Maketrade. Kaya lang meron instance na biglang nagsasara yung browser. Sa celfone naman, medyo alanganin, (single core 1 Ghz ram below 512 MB) since mababa lang yung specs nung celfone ko. I'm planning to get a phone with better specs - kapag meron na post ko dito. When it comes to charting especially java charts, unless makakakita ka ng tablet or mobile phone na java capable; hindi gagana yung Chartnexus charts sa tablet. Same case din ito sa COL charts. 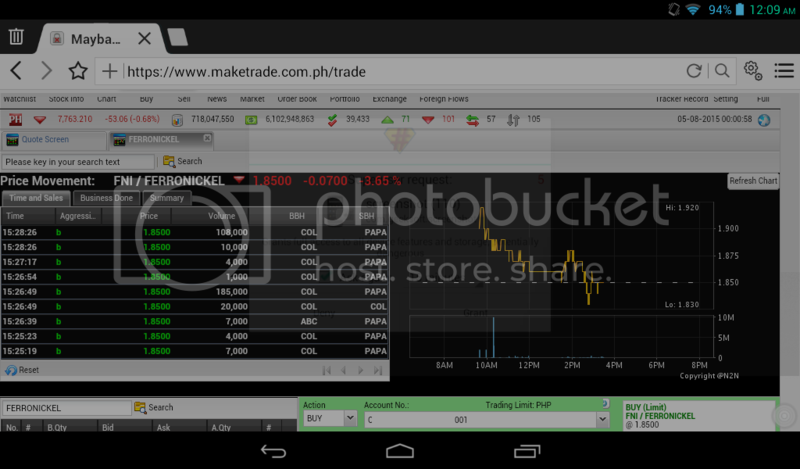 Subukan ko sanang mag-upload ng screenshots using tablet kaya lang mukhang naka maintenance mode yata ang maketrade ngayon. thanks for the feedback. senor mon said that there will be an html5 version of chartnexus coming soon. 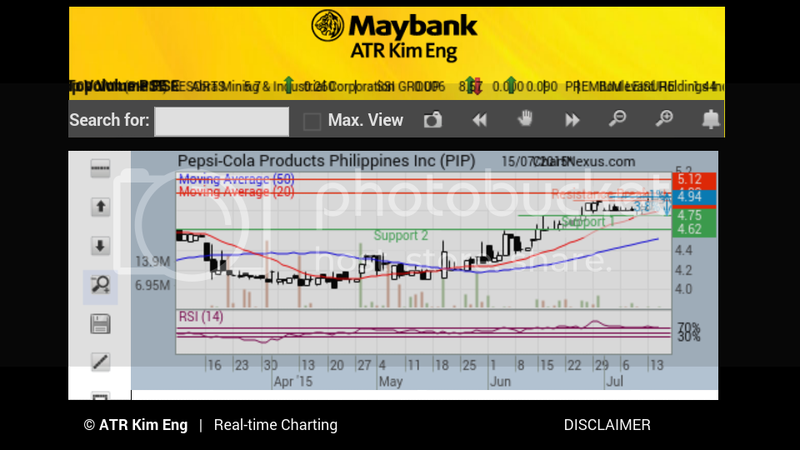 ako i cannot open both the trading interface and charting on phone/tablet. i think it's java and di nmn nakakainstall ng java on android phone. i think also same apply to ios. 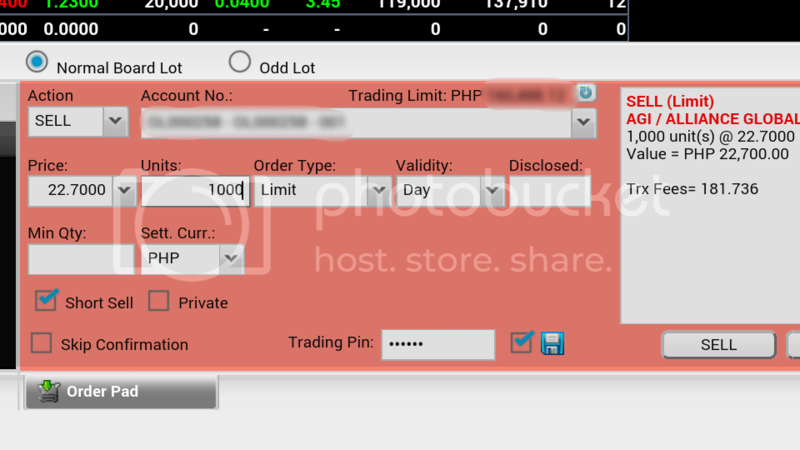 (05-08-2015, 08:07 AM)you101 Wrote: ako i cannot open both the trading interface and charting on phone/tablet. i think it's java and di nmn nakakainstall ng java on android phone. i think also same apply to ios. Yung charting, hindi siya talaga magbubukas, pero yung trading interface nagbubukas naman. Heto yung snapshots using a tablet. Boat browser ang gamit ko. Unang load niya eh may lalabas na ganitong message. Tap continue. Afterwards the interface will load by itself after a few seconds. Another snapshot showing the line chart of a stocks' intraday chart. Gamit ko nga pala na tablet eh Lenovo, dual core @ 1.2 GHz and 1 GB ram. Subukan mo siguro buksan sa stock browser yung site or download ka na rin ng Boat Browser. Ayaw mag-open ng chart nito sakin.. Firefox gamit ko. 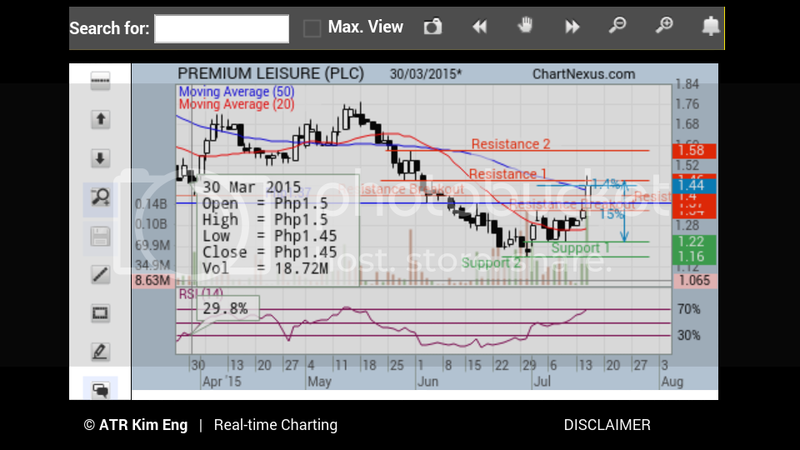 (06-30-2015, 03:11 PM)ippfx Wrote: Ayaw mag-open ng chart nito sakin.. Firefox gamit ko. Firefox din ang gamit ko. Recently napansin ko din na ayaw bumukas nung charting software. Kanina may update na yung Java. Nag-update ako ng java tapos ayun gumagana na ulit yung charting software. This is just an update. Browsing through maketrade platform using a mobile phone. I'm using a 4.5 inch, 1.2 Ghz quadcore phone with 1 GB Ram, again using Boat Browser for android. Upon logging to your account this message will appear. Just tap the continue tab. The sell order. Notice the short sell box ticked. A prelude to the possibility of short selling in the near future? Tried doing a short selling once but my order just got rejected..
A snapshot of the ticker. It's small so I have to zoom in to get a better view. It's challenging to use this one especially if your the kind who likes to trade what you see on the ticker.. But wait there's more. I just discovered this a while ago. The charting software actually works on my mobile phone. A big help for those who use the charts as a guide in buying/selling. This one with the support and resistance plotted. Notice how the chart gets messed up. Just for comparison. These snapshots came from my 7" tablet. Again using Boat Browser in full screen mode and in landscape view. This one with the support and resistance plotted on the chart. The chart still looks nice. Once closed na market, magsesend sila ng buying invoice, pero yung fees na nakalagay is less than that displayed sa MakeTrade interface. I looked up the fees computation sa website (https://www.maketrade.com.ph/pages/faq-account-charges#) and it might have been the PSE Fee (.00005% of trade's gross value) na hindi included sa invoice kaya mas mababa, pero nung cinompute ko, 'di pa rin siya nagtutugma. Can someone enlighten me regarding this? Salamat!